This is a great way to start growing vertically. Extremely easy to set up, use and grow. It is ideal for areas with limited space, like decks and patios. If you are new to vertical gardening, this Foody 8 is the place to start. It's a highly efficient way to grow herbs, strawberries, greens, and vegetables, and uses only 10% of the water needed in a traditional garden. Soil is used as the growing medium in the stacking pods. Plants in the base reservoir are grown hydroponically using just water and liquid nutrients. Ideal for both indoor and outdoor growing in all climates. Simply fill the growing pods with potting soil and hand-water thereafter. The tower may be rotated as needed to maximize light exposure when indoors. Each growing pod has 8 growing pockets and the base reservoir has 8 growing pockets for a total of 40 planting spaces! HOW TO GROW: Plant starts or seeds are placed directly into the soil in the growing pods and in the net pots in the base reservoir. Then simply water the plants and regularly rotate the towers for sun exposure. WHAT TO GROW: The options are really limitless. The large growing pockets allow for plants with more substantial root systems. We have seen growers have great success with peppers, strawberries, broccoli, Brussels sprouts, lettuce, cabbage, spinach, kale and other leafy greens as well as many types of herbs. 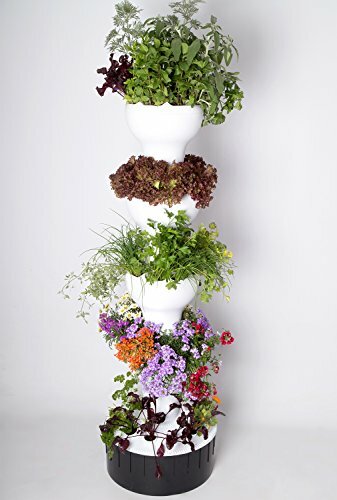 YOUR INTRODUCTION TO VERTICAL GARDENING: Easy to set up, plant and maintain. LIMITED SPACE? NO PROBLEM: Grows 40 plants in just 2 sq ft. in your home, on your deck or patio. GROWS IN ANY CLIMATE:. Deep soil protects roots. Easy to move indoors, or into the sun or shade. USES POTTING SOIL in the growing pods and water and liquid nutrients in the base reservoir (which is hydroponic).